This is a revamp of one of the pieces that I picked up at this year’s trash or treasure, (which was last weekend.) 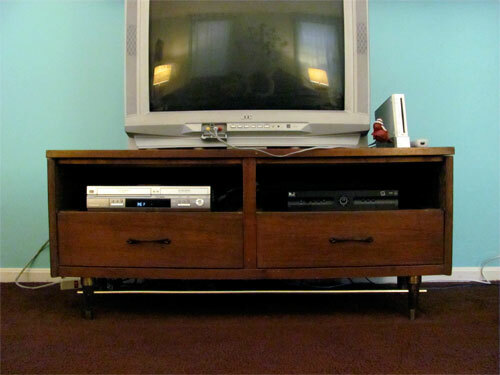 I’ve been looking for a new tv stand for quite some time now for my living room and haven’t had much luck. The CB2 one (here is the green version) that I had originally thought would look nice in the space was sold out before I got the chance to purchase it and now they don’t carry it in white anymore. 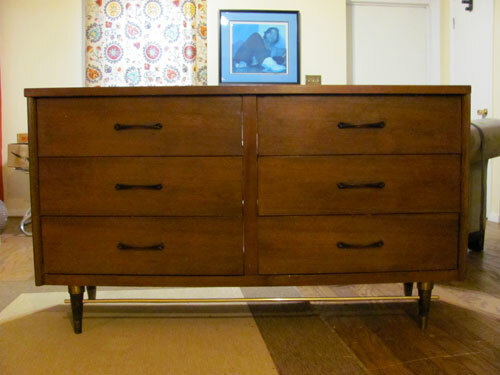 So at trash or treasure I set out looking for something that would work as a tv stand or be converted to a tv stand. Luckily I found a low bureau that I thought could be updated nicely. I couldn’t be happier with the results. I think it looks really nice, fits the space, holds my electronics and best of all—it was free! All I need to do now is update the hardware…I’m thinking these beauties from Anthropologie in Palace Yell0w will be perfect finish to the piece. This entry was posted on Monday, April 18th, 2011 at 1:02 pm	and is filed under interior design, my house, thrifting. You can follow any responses to this entry through the RSS 2.0 feed. You can leave a response, or trackback from your own site.